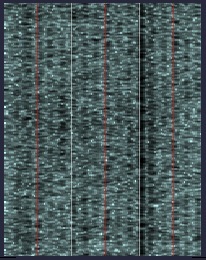 One example of TDM and FDM signals often arises on 3,860.000 khz. 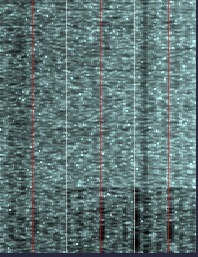 It consists of many channels, 6 per KHz (intervals of about 166 Hz), all containing digital data. It sounds somewhat like a buzzsaw. TDM will activate a DSP process that is capable of removing all of these carriers within a 4 KHz range starting from zero in the passband of the AM or SSB demodulators. Right-clicking on TDM (Time-Division-Multiplex filter) accesses the Comb Tooth and interval controls. Removal of TDM is done using a dynamic, adjustable comb filter. The TDM I've encountered uses 166 Hz intervals; the first tooth you can hear is then at 166 Hz if you are tuned to the starting frequency. 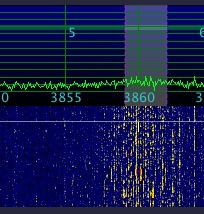 For instance, when you're tuned to 3860 KHz, the TDM broadcast right at 3860 KHz has its first tooth at 0 Hz (which we can get rid of just by setting the edge of the demod passband to 50 Hz or so. So that frequency doesn't have to be part of the comb) and its second tooth at 166 Hz, which we typically can hear. So in this case, the Comb Tooth would be set to 166 Hz, as that's within the range of the adjustment (100-300 Hz) -- then the DSP takes over and the interference is reduced for all the teeth. If you're not tuned right to the base frequency of the TDM signal, the Comb Tooth frequency control has enough range to get you on a frequency that is a extended multiple of the rest of the comb teeth within the passband. Once you do that, the DSP code will figure out the rest. Here's how that works. Let's say you're tuned 300 Hz higher than the TDM in LSB. Therefore the TDM starting frequency moves away from you accordingly, 300 Hz up (because you're in LSB.) So the starting frequency moves from 0 Hz to 300 Hz (relative to your tuned frequency), which moves the TDM teeth (frequencies) up to 300, 466, 632 and so on. But if the signal had other teeth lower than its starting frequency, because the interval 166 Hz, the next interval down would be 134 Hz, which is within the adjustment range of the Comb Tooth control, so that's where you'll end up setting it for the maximum desired effect. All the tech details aside, you simply do this by ear; just leave the interval at 166 and slowly adjust the Comb Tooth until you hit the nearest multiple of 166 from where the TDM interference starts, and the DSP engine will take care of the rest. If the TDM you're experiencing is not at 166 Hz intervals, you'll also have to set the proper interval in order for all this to work. Just FYI, though, so far all of the TDM signals I've encountered have utilized 166 Hz intervals.